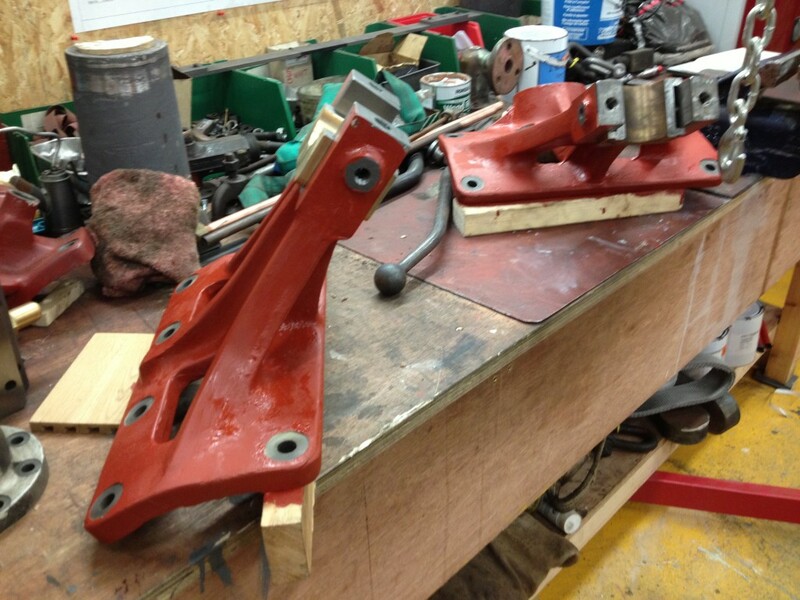 Below: David has completed the patters for the axleboxes and keeps. The plug, seen in the top left of this picture, is to enable a core for the rebate housing the spring to be created. We will use coil springs, through the middle of which a lubricating pipe will run to feed the journal and bearing internally. 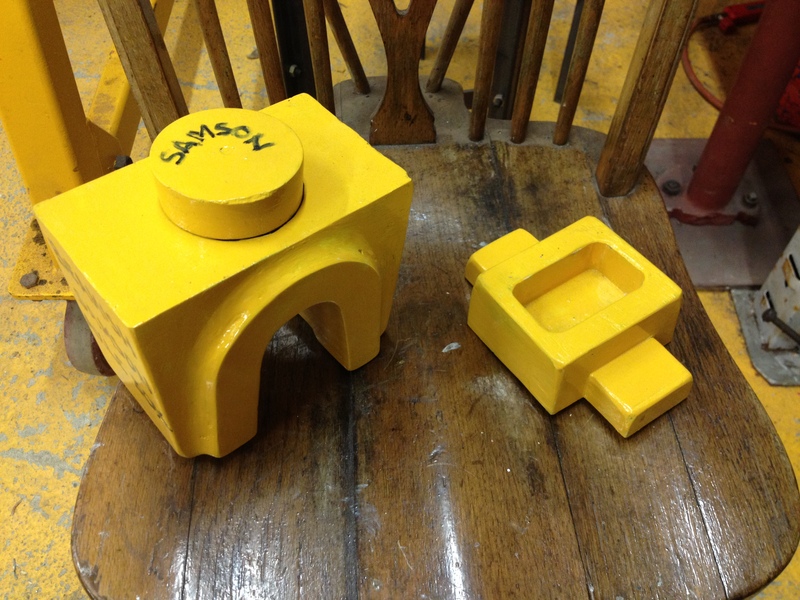 Below: The machined and primed crankshaft pedestals are seen here, ready for jigging and offering to the boiler shell. Below: An overall view showing the pedestals in place, with the weight being taken by the cranes whilst adjustments are made. 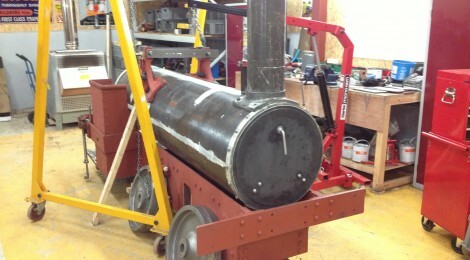 Note also that the smokebox door is now fitted in place, though subject to a few adjustments to enable it to sit a little lower and more centrally on the ring. 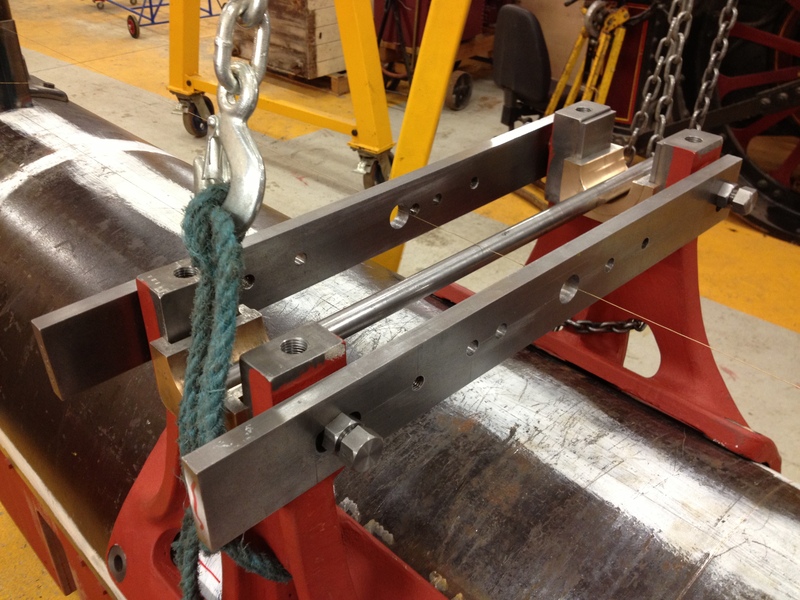 Below: A close up of the pedestals, with two strips in place to act as a jig and hold them at their correct spacing. 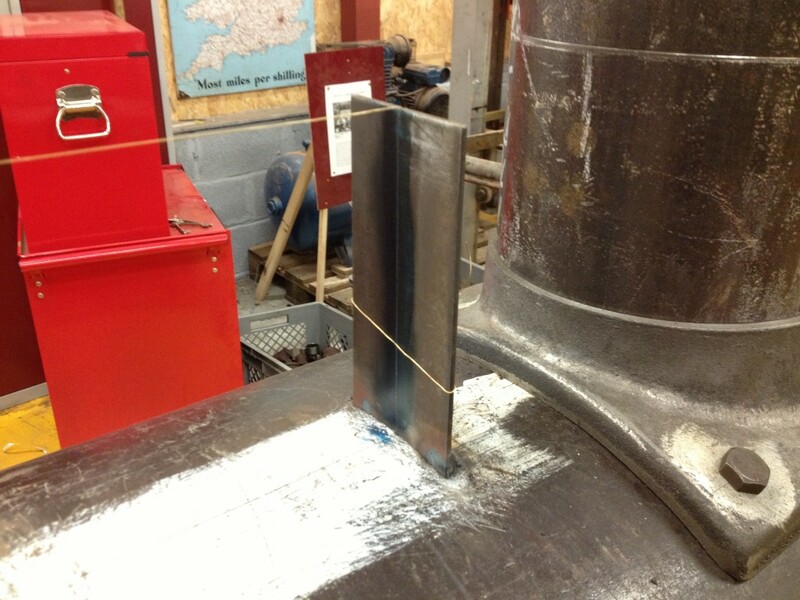 Note also the brass wire running through the holes in the jig – this is on the centre line and is an aid to alignment, the centreline also being marked on the boiler as the absolute datum. Below: At each end of the boiler shell a steel plate has been welded, with guides to accurately align the brass centreline wire, from which all of the engine unit will be set – it is therefore a very important but simple component in the construction of Samson! 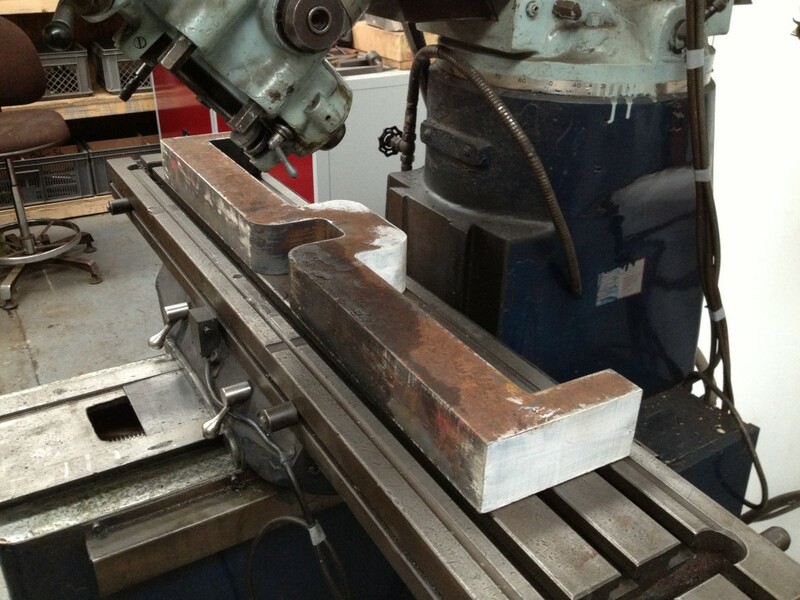 Below: The crankshaft blank, placed on the milling table. The square edges will be removed, to reduce the amount of metal to be removed in the lathe and reduce the ‘lob’ of what is a cumbersome piece of steel. 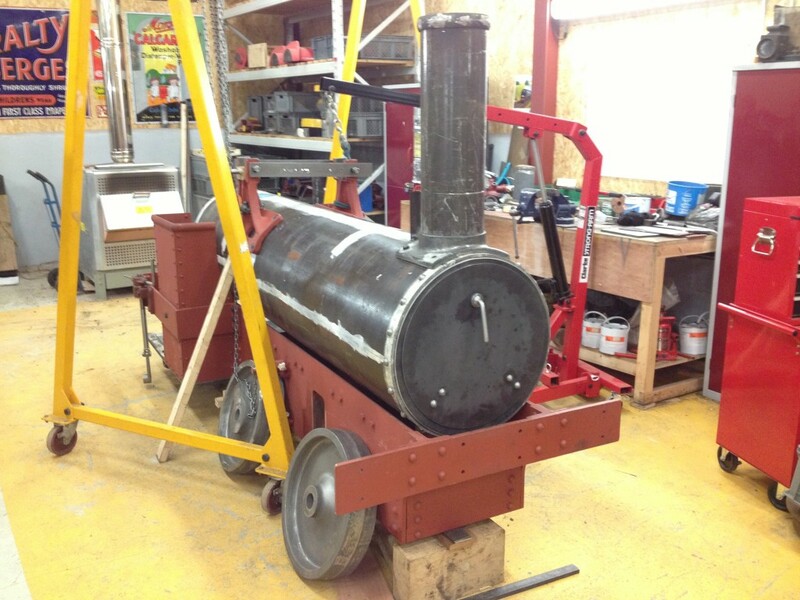 This will be a lengthy and complex exercise but one David is hoping to start imminently, to enable the crankshaft, its bearings and the pedestals to be completed before Christmas. Patterns for the eccentrics and straps have already been made and so another visit to the foundry is due in the very near future.